What goal incited your craziest celebration? Shannon: Gold cup final 2011. In a section of 400 people surrounded by 90,000 Mexico fans. Celebrating those first 2 goals was absolutely amazing. I was in the first row and ended up 3 rows back, I had a shoe print bruise on my calf. It was the happiest I’ve ever seen some of my friends. It was on par with the Michael Bradley special standing in the cage at Azteca (unfortunately altitude sickness hit me on the bus ride to Azteca after being in Denver and Mexico City). Celebration not at a game: watch party 2014 World Cup, Clint Dempsey vs Ghana. If you can’t be at a game, celebrating in your official bar is the only other place to be. Alexa: John Brooks header goal in the 2014 World Cup. Crowd Surfed at MacDintons Irish Pub after the goal while people were spraying beer all over me. Becca: Haha, I legit just stood there and cried while everyone was jumping up and down and hugging me. What are your weird game day superstitions? Alexa: On game day I wear my white AO Tampa Jersey. We always drink mimosas for brunch before the tailgate. Becca: I wear the same bra to every. single. game. How did you first get involved with AO? 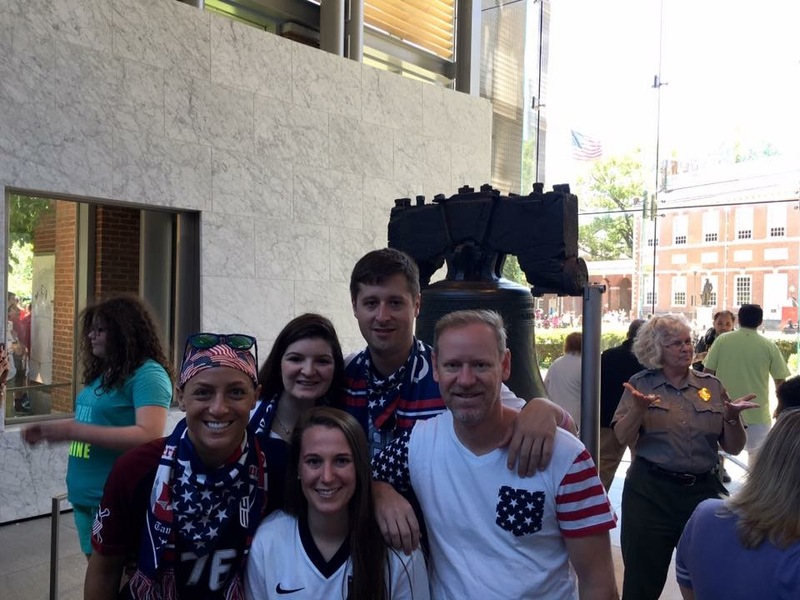 Shannon: I met a random group of crazy soccer fans online and drove from Florida to New Jersey with some of them and stayed with others after only having met one of them in person. That game vs Argentina was my first time sitting with AO. Alexa: I went to MacDinton’s (Tampa’s chapter bar) to watch the USA vs Mexico game in the 2013 Gold Cup. There I met Andres Isaza and Michael Fera who were draped in red, white and blue. I immediately knew I wanted to be apart of this club, AO Tampa. Becca: This is a good story that dates all the way back to the WWC in 2015. I had always been a casual fan but I began dating a guy (whole shall remain nameless for this interview, but y’all know who). He brought me to MacDinton’s, the AO Tampa chapter bar, for a few WWC games. It’s where I met some of my now very best friends including, Lex DellaRocco, who def tried to make out with me during the first goal of the game. A few months went by and I was no longer dating said guy but a game had come up and I decided I was going to show up to MacDinton’s anyways. And here we are 3 years later and I am on the leadership team. What is on your wish list to do or experience with US Soccer? Shannon: Watching a US soccer team win a World Cup in person. Alexa: Going to the World Cup is on my bucket list for US Soccer. Becca: I think I would really just love to do a work out with the Women’s National Team. Who do you most admire/who is your favorite player? Shannon: Landon Donovan and Michael Bradley will always be my favorite players. Landon helped me fall in love with this team all the way back in 2002 and Michael Bradley helped keep me on this wild ride. Alexa: Favorite player is Clint Dempsey. I have more Dempsey jerseys than any other player. What do you want to get from this community? Shannon: I’ve already got what I wanted, friends for life. Some of the best people I will ever know or meet. I know they are there for me whenever I need them no matter how far a part we live from each other and I will always be there for them. Alexa: I want to become friends with people who are as passionate and patriotic about our country’s national teams as I am. 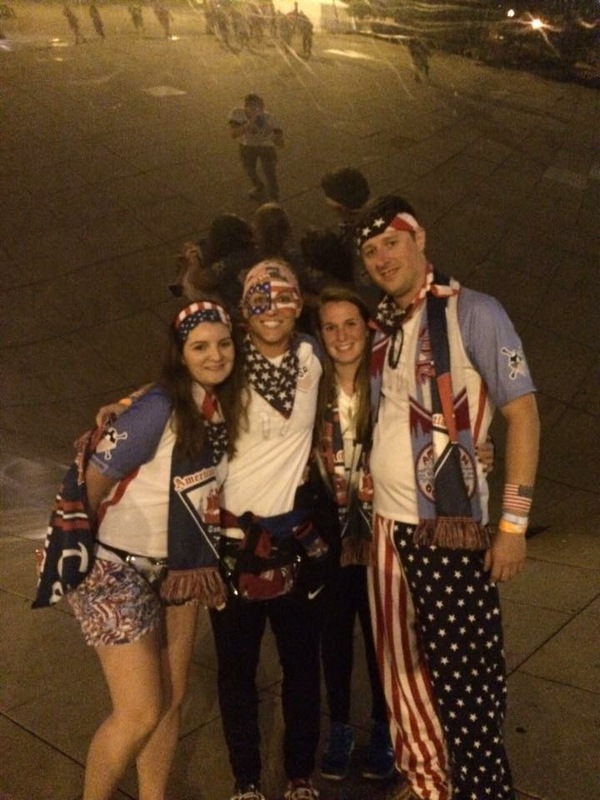 Becca: Don’t get me wrong, the experiences are amazing, the organization is phenomenal, and the trips are always worthwhile, but the most important thing AO has given me is lifetime friends. I rely on people I have met in AO daily. They are my tribe, my support system, and I don’t know what I would do without them. So in short, friends. What was the happiest moment as an AO member? Shannon: I don’t think I have one happiest moment. The friendships I’ve made through AO will always be with me. But celebrating that win in Orlando one night and going to Epcot with those amazing people the next day was amazing. Alexa: Happiest moment was at the Columbus night before party when Rob Stone made his famous “We’re not a Red state, we are not a blue state” speech. Becca: Umm, good questions. I have so many. I think the happiest moment would be marching into Azteca with my favorite people shouting AO TAMPA WE ARE HERE WOAH WOAH! What is your most impactful memory with AO? Shannon: After the pulse nightclub shooting, we collected donations at our watch party and as a chapter, were able to help in that little way. Also being able to support and be there for my fellow AO members during the hard times life seems to throw at us. Alexa: Most impactful memory is driving to Jacksonville with AO Tampa members Becca Keyes, Dakota Clabaugh and Chris Frake listening to nothing but USA songs the whole way up. Becca: It was a quiet moment after all the excitement faded. We had just lost to Mexico at Columbus. Everyone quickly left the stadium, except us. We just piled on top of one another in the bleachers in a big group hug taking in the loss together. Tell us something you’ve done with an AO friend that wasn’t soccer-related? Shannon: Attended weddings of fellow AO members. Traveled Ireland. Vacationed in blue ridge, GA. Skiing in New Hampshire. Went to universal, Disney, Epcot. Flew to Milwaukee to celebrate a friend moving back to the USA. Attended AO Ball in Boston! Alexa: Went Skiing with Becca Keyes and Shannon Long in New Hampshire in 2016. Becca: The great thing about AO friends is that we really are friends! We talk, hang out, fight, and are there for each other 100%. For New Year’s Eve I met up with Hunter Rackley of AO Hattiesburg and Andy Dole of AO Buffalo in New Orleans. We had an amazing 4 days exploring Hunter’s home town! We did Bourbon St. of course but the best part was getting dressed up, drinking fancy cocktails, and eating all of the delectable food NOLA has to offer! We spent NYE at the Orpheum Theatre watching The Revivalists from about 15ft from the stage. How far have you traveled for a US Game? Shannon: My first international game was Germany vs Poland in Germany. I was living over there and it was amazing to share the beautiful game with my friends. I was lucky enough to watch that team in the World Cup that summer. I’ve also been to Ireland, Cuba, Mexico, Jamaica, and T&T to watch this team. Alexa: Farthest I have traveled is to Mexico City for the US vs Mexico hex game in 2017. Becca: All the way to Pasadena, California from Florida for the 2015 match against Mexico at the Rose Bowl. What do you want to do or experience more then anything in the next 4 years? Shannon: Get people excited about this team again and introduce others to this new and extremely exciting generation and celebrate our women winning it all in France next summer! Alexa: I want to experience the US beating Mexico in person. Those games are definitely the craziest I have ever been to. I get goose bumps thinking about it. Becca: Looking forward to France next year!